The Safdie brothers love making movies set on the streets and though Heaven Knows What certainly had its share of action, it was clearly a drama while their latest, while still being a story that unfolds on the streets of New York City, feels far more like a chase movie. Good Time stars Robert Pattinson as Constantine, a young guy who finds himself running against the clock to have his brother released from Rikers Island after a botched robbery. Along the way, Constantine digs himself deeper into the underbelly of NY's nightlife and if the new trailer is any indication, running non-stop for the movie's 100-minute running time. The first trailer felt very much like a drug-induced thriller but this newly minted trailer is all action all the time and it looks fantastic. 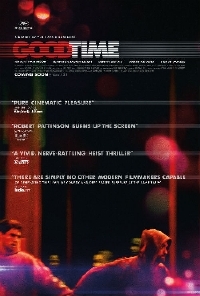 Good Time opens August 11.